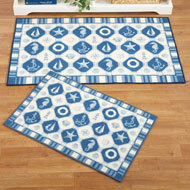 Icy Blue Poinsettia Christmas Rug Set from Collections Etc. $19.99 $13.97 Save up to 30% Now! 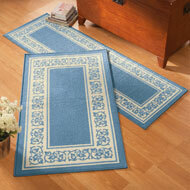 This beautiful 2-piece rug set features a dark blue border, icy blue background and a stunning blue and silver poinsettia design in the middle. 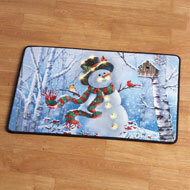 Cushioned rugs add seasonal color, provide relief for tired feet and have skid-resistant backings. Hand wash. Polyester and plastic; imported. Rug is 19" x 27"; runner is 20" x 40".